Today was a milestone. I don’t remember the last time I wore a pair of shorts out of the confines of my backyard, but today, I rocked shorts at a popular lake on a holiday. Not too long ago, not only would I have not worn shorts, but I would have thought about not going and not participating at all. Recently I had a profound experience that changed my perception of self and perception of fun, for the better. After giving birth to two babies a year apart, it’s no surprise that I barely recognize my own body these days. Before I got pregnant with my oldest daughter, I was at my then heaviest weight. Multiple miscarriages, failed fertility treatments and the whole world seemingly pregnant around me left me depressed. I quit cross fit and turned to food for comfort. Two surprise pregnancies back-to-back left no time for recovery in between. With all the physical changes motherhood brings and the lack of time and energy for self-care, let’s just say my baseline is frumpy at best. This spring a friend of mine excitedly announced on Facebook that her cousin was participating on “Dancing With the Stars.” This show is my guilty pleasure. I love everything about it; the dancing, the creativity, the complicated set changes, the growth that happens in the stars from the beginning to the end and all the feelings that this journey produces. When my friend found out how excited I was, she invited me to come with her to the finale! It was a once in a lifetime opportunity; my husband and I agreed that I had to go. Secretly, however, I did not want to because I felt so uncomfortable in my own skin. Along with the lack of confidence in this new body of mine, I didn’t have a lot of clothes that I could fit in. Especially glamourous clothes fit for TV! I also didn’t have any dress shoes since my feet had grown two sizes during pregnancy. A quick trip to the mall and I was set with a new dress, black high heels and some new makeup. Even with the fancy new stuff, I was still feeling awkward, uncomfortable and far from confident. The big day came and our travel plans hit road block after road block until we weren’t even sure we were going to make it on time. Our flights had been delayed multiple times over the day which had us arriving in LA in the middle of rush hour. We made it to our hotel a few blocks away from the show with just about 20 minutes to get there. With no time to check in, we changed in the lobby of the hotel and ran the few blocks to “Dancing With the Stars.” There was no time for all the buttons on my new dress, no time to get a new makeup technique just right, and no definitely no time for running in heels! We arrived just in time; sweaty, breathless and thankful! All the stress of the day burned away all my negative self-image and lack of confidence. It was so fun; everything I had hoped it would be! And to think I might have missed out on this over something as trivial as baby weight? So lame and so not the example I want to set for my girls. My husband and I watched the episode after I made it home and my face did end up on TV in the crowd. Instead of cringing about it, I made a purposeful effort to have fun with spotting my face in the audience. My plan is to carry this lesson over into this summer and hopefully every summer to come. I’m going to embrace all the fun experiences that come my way and not miss out over being embarrassed. This is how I ended up writing this with sunburned legs. These legs haven’t seen sun in a couple years, but they were out in the world today. When the weather here warms up enough for swimming, you bet I’m going to be enjoying the water in my swimsuit. 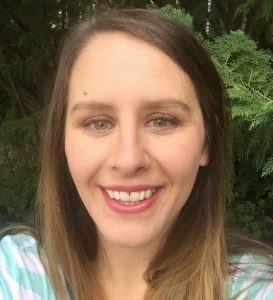 Jessica Haberman is an emergency/trauma RN in Vancouver, WA. She’s the mom of two little squirrels – um, girls – and the wife of an entrepreneur.